TestTubeTM is a new digital network from DiscoveryTM. With shows like Stuff of Genius, Blow It Up!, and Distort (where “great ideas become reality”), it holds strong appeal for mathy folks. The puzzle is this: Form an expression with three 1’s, three 2’s, three 3’s, and so on, up to three 9’s, so that the value of each expression is equal to 6. As an example, an expression using three 7’s is shown below. Can you find expressions using the other numbers? You can watch Six the Hard Way, but be forewarned: at least one solution for each number is given, so you may want to solve the puzzle before viewing. Also note that some folks have posted solutions in the comments below, so scroll at your own risk. Entry filed under: Uncategorized. Tags: 6, Brian Brushwood, Discovery, puzzle, Scam School, TestTube. Using BODMAS it happens. Try to look at it like this. Alright, here’s my best explanation.8/8 is 1(order of operations say division first), add 8 to get 9, square root 9 to get 3. And then finally factorial the 3 to get 6. I assume you had issues with the factorial, so I’ll explain that real quick. A factorial is symbolized by ! and is actually quite simple, you actually just multiply the number by all the numbers that come previously. For example, 3! Is 3x2x1 or 6 and 4! is 4x3x2x1 or 24. I know this is a little late to explain this to you, but if you still needed the explanation, your welcome! Fun fact, your average handheld scientific calculator can only process up to 69! (not a joke, that’s true) while more complex calculators such as the TI-Nspire CX (which I have and love) can do up to 449! which is a rediculously large number. Google calculator says it’s equal to infinity, lol. It’s actually equal to 3.851930518 E+997. P.S. a googol (a 100 zeroed number) is only E+100. Also, don’t ask me how I have all this stuff memorized, I’m just a HUGE nerd. If you want me to clarify anything else, I’d be happy to. I actually got all of these before watching the video … Then started watching the video and realized that my solution (which was trivial) was NOT the only one so I spent time working out their solutions too … VERY COOL problem (and the three zeros 0 0 0 = 6) is good to which you forgot to list. Zoiks! Thanks, Zach! I can’t believe i forgot three 0’s. I’ve corrected the post. I gave this book to my mathy teenage son, and he loves it. His mathy family is also enjoying it–so much so that I bought two more copies to give to fellow math-loving folks. I feel like adding “squared” is a bit of cheating. That’s introducing a digit of 2. How far can we go? Who’s gonna post for 11’s? Part of the deal is no numbers added, including powers. Roots are acceptable. Typing “squared” is the same thing as adding the 2. Zach, I updated your comment to use LaTex. He didn’t write  he wrote ⌊⌋ = floor (i.e round down to closest integer). Okay, wavecollapse… I give up. What were you thinking? can somebody explain this one? Nice! I hadn’t thought to use trig functions. Love the creativity! Yeah… true. Since infinity isn’t TECHNICALLY a number, you haven’t technically added any numbers. Clever girl…. My solution for 8 didn’t involve factorial. General solution for n n n: (Count(n, n, n))! Your function always results in 6, Raghava, but I think it violates the rules of the game: it introduces two 3’s and a 2 in each expression, and it only uses the required digit twice. Jos — I updated your reply to use . Your solution looks good except for 8s. I think by using the cube root, you’ve added three 3s, which seems like a violation. Is there another symbol that means cube root? I’m not aware of one. not a single number added. Not sure I agree with this solution, Hunter. The problem statement asks for an equation (“the value of each expression is equal to 6″) — yours would be considered an inequality — and an equal sign was included with each group of three numbers. I’d also point out that 2 + 2 + 2 is, in fact, equal to 6, so that’s a problem, too. But nice try. I appreciate out-of-the-box thinking! Here’s my thought about great problems: they get people thinking! I don’t care so much that people think about different things, as long as they’re thinking! No cheaty methods as Math.Floor.. I have an objection to using SQRT or a radical sign. This is technically inserting numerals into the problem. I watched the first few minutes of the Scam School video and remember the explicit direction of not inserting numerals into the problem. The example given was not using the cube root of something because that would insert a 3 into the problem. If you can’t cube root you can’t square root. The index of the radical maybe unwritten but it is understood to be 2. If the puzzle is not to include extra digits I don’t see how it’s proper to use roots. The only root that I would permit would be to use a left-hand number as the index of the root of its right-hand neighbor. I like the suggestion of using a number as the index of the root for the number to its right. I don’t know if that actually helps get a sum of 6 in any case, but it’s creative. As for not including SQRT, perhaps it’s a valid point. But the Scam School guys used them, and I wonder how many of these are possible without SQRT. Do you have solutions for all of them that don’t use roots? 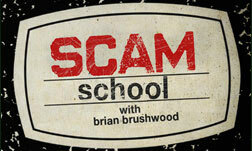 I’ve rewatched the Scam School video several times to listen to the language of the setup. I realize that — although I think it woud be more interesting to exclude the insertion of all specific or implied nurmerals — the original setup was that “any symbol could be used … you just can’t draw another digit.” The not “drawing” a digit does grant permission to use log, ln, sqrt, etc. that might have implied indices or bases. This works for any real number. Sorry to ruin your efforts to find answers for as many numbers as you can… I guess I found the answer to all of them. how can u add a number to number 9 and the result is 6 only using additon??? If I understand your question correctly, John, I think the answer is -3. That is, 9 + (-3) = 6, and this uses only addition. I don’t know your age, so perhaps you’ve not yet learned about negative numbers. Beautiful, Bob! Probably the most elegant general solution we’ve seen to this problem. Log base 10 is assumed. It’s the default for many calculators so it seems fair to use it. The use of a ( . ) doesn’t seem to violate the rules either. Puzzle: 7 + 7 + 7 + 7 is equal to 28… How can you switch two sticks to make an expression equal to 6? Kelvin, I assume this is a matchstick problem where each of the 7’s and the +’s are made with two sticks. Is that correct? It’s not. As Bob noted below, (0 + 0 + 0)! = 1, not 3. That should read: (0! + 0! + 0!)! = 3. Will, I’m not sure I understand the question. Do you mean, do I know how to make 11, 13, or 14 with three 6’s? I don’t, but if you confirm that that’s your question, I can give it some thought. I’ve got that so far, anybody got 14? I don’t think inserting decimal points would be allowed, as that fundamentally changes the number. So I think your solution for 13 would be disqualified. And I suspect there’s a typo in your solution for 11 — I love the use of four factorials and two square roots, but 11!!! is a number much too large to get back to 6 even with multiple square roots. That same approach would work for 14 and 15, too. As a follow up to 11, I remember reading somewhere that a triple factorial was the number multiplied by every 3rd number below it: 11x8x5x3. But after looking into that I now realize that information was false and 11 is wrong. As for 13, using the decimal was the only way I could get it to work, but if that’s not allowed then I guess that’s wrong too. Gonna have to work on those odd numbers a little more.